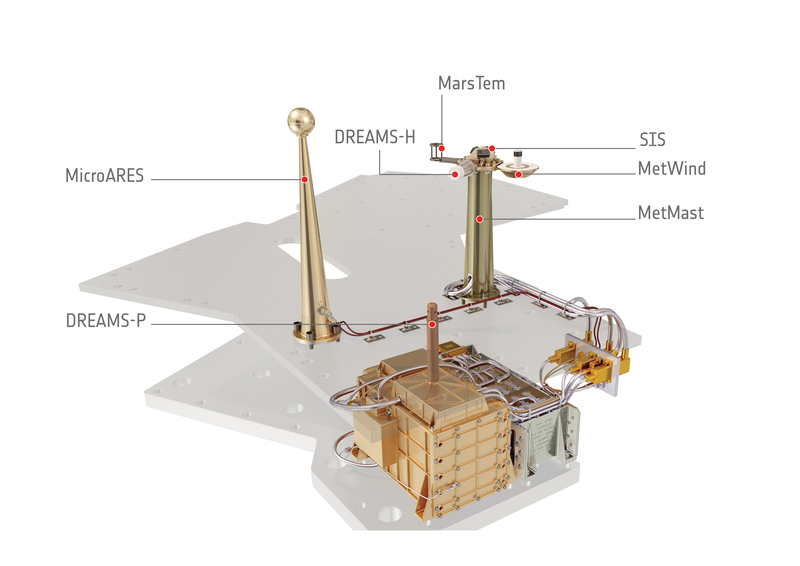 This artist's impression shows the DREAMS science package that will be carried on the Schiaparelli entry, descent and landing demonstrator module. Schiaparelli, part of the ExoMars 2016 mission, will launch with the Trace Gas Orbiter in March 2016 arriving at the Red Planet in October of that year. DREAMS (Dust Characterisation, Risk Assessment, and Environment Analyser on the Martian Surface) consists of a suite of sensors to measure the local wind speed and direction (MetWind), humidity (DREAMS-H), pressure (DREAMS-P), atmospheric temperature close to the surface (MarsTem), the transparency of the atmosphere (Solar Irradiance Sensor, SIS), and atmospheric electric fields (Atmospheric Radiation and Electricity Sensor; MicroARES) at Mars.